During YouTube's BrandCast Thursday night, CEO Susan Wojcicki claimed her company reaches more 18- to 49-year-olds on mobile alone than any TV network. It was only a matter of time before someone from the TV side—say, several networks—returned fire, and that was most likely to happen during the upcoming broadcast upfront presentations. Instead, it took less than a day for someone to push back against YouTube's bold claims about audience reach—and it happened at a NewFronts event, no less. 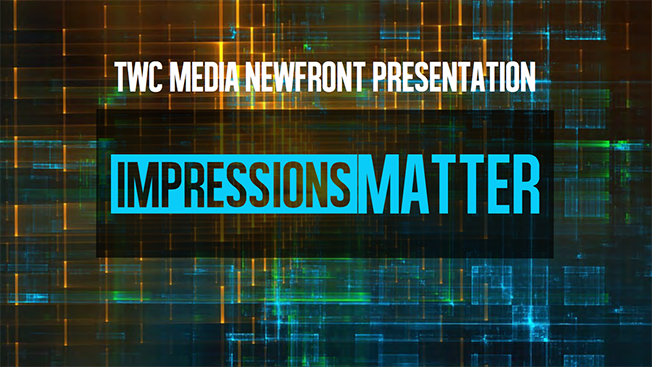 Time Warner Cable Media took up the charge, devoting its NewFronts presentation at New York's Edison Ballroom to making the case that TV is still by far the best way to reach audiences. And yes, that includes millennials. While the company didn't specifically address Wojcicki's comments—nor, for that matter, did it discuss the impending Charter merger with Time Warner Cable—several execs took aim at Facebook, YouTube and other disrupters' claims that audiences are abandoning linear TV. "The choice today is not a matter of TV versus digital. Cable TV is digital," said Fred Bucher, head marketer at Time Warner Cable Media, who talked about how unreliable ad-tech measurement continues to be. "While it's all digital, not all digital impressions are created equal," said Bucher, noting that Yahoo claimed that its October livestream of an NFL game broadcast drew 33.6 million streams and 15.22 million unique viewers. However, the average audience per minute for the livestream, which is the same metric used in TV ratings, was just 2.36 million total, and 1.64 million in the U.S. The TV NFL broadcasts averaged 18.2 million viewers per minute, which is 11 times higher than Yahoo's numbers. 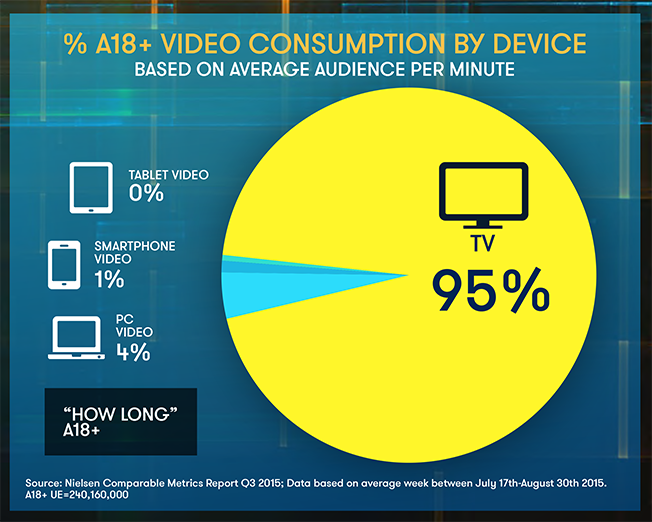 Bucher cited Nielsen data showing that TV accounts for 95 percent of average video consumption by device (using the average audience per minute), while PC video (4 percent) and smartphone video (1 percent) trail far behind. Among millennials, TV still presents 88 percent of the video consumption by device, with PC video at 8 percent, and smartphone and tablet video at 2 percent each. Last year, Time Warner Cable Media shared its NewFronts stage with its competitors, hosting a summit for Comcast, Cox and Cablevision execs to discuss how the cable industry is driving digital innovation. The company returned with a solo presentation this year, but its NewFronts message remained the same: Shift ad dollars away from broadcast/cable and its related platforms at your own peril. Joan Gillman, evp and COO for Time Warner Cable Media and chairman of the Video Advertising Board, spoke onstage with Sean Cunningham, the VAB's president and CEO, about a recent VAB study that created an average-viewers-per-minute metric to find out how a variety of digital platforms would rank as TV programs. Among all adults, Facebook would come in 158th among current TV programs, YouTube would rank 354th, Instagram 1,420th, Snapchat 2,331st and Twitter 2,902nd. Among millennials the platforms fare better but still lag behind the top TV shows: Facebook is 27th, YouTube is 49th, Instagram is 275th, Snapchat is 563rd and Twitter is 1,216th. When not skewering its digital competitors, Time Warner Cable Media touted its abilities to connect advertisers with local audiences via its local content. Beth Plummer, group vp of sales, said all TWC news websites would be redesigned this year, which gives advertisers new opportunities to reach local audiences. Time Warner Cable will launch a sports app in the third quarter with live streaming and VOD options for local games. The company discussed enhancements made to its Kernel data tool, which helps plan and optimize campaigns, using "access to hundreds of household attributes" and anonymous household viewing data, said Sean Coar, group vp of strategy and business decisions. Kernel can help deliver addressable campaigns directly into households, via dynamic ad insertion. Time Warner Cable Media shared new findings about millennials from TV Tribes, its audience segmentation analysis tool introduced two years ago, which blended Nielsen insights for new looks at millennial viewing habits. Among the stats: millennials spend an average of 73.7 hours watching video each month, with 97 percent of overall viewing via traditional TV accessible via Time Warner Cable: 71.8 hours, compared to 9.9 hours a month on YouTube, and 18.5 hours a month for Facebook. The event closed out with a performance from Leon Bridges, whom Bucher tied into the event's "impressions matter" them by noting that "he has been making a huge impression around the world."